The Father's Day shocker of the year,this dad was so perfect, it was frightening.Bill Rundle may have won Las Vegas's Father of the Year award, but when his wife's corpse was found, the other side of the all-American dad was revealed: a manipulative con man, professional thief, and savage killer whose crimes reached back through the decades. 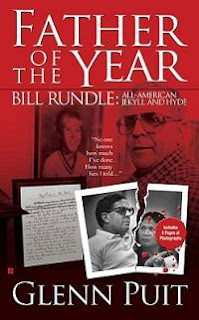 Bill Rundle won the Father Of The Year Award after his son,Richard Rundle,sent a letter describing his dad.Little Richie Rundle was a diabetic and his father,Bill,had been raising him as a single father.Richard Rundle then died after a woman in a car ran him over as he was waiting for the bus.He was 11 years old. The childhood of Bill Rundle is covered briefly in this book,probably because it was so uneventful.His parents by all accounts were normal people.After that begins the multiple marriages,children who would be deserted by their father,even one wife who was deserted while she was still pregnant.This man seemed to have an aversion to normal work as we know it.He preferred making his money gambling and even better,by having a woman look after him.He also went through a stint where he pretended to be attending college but in fact had given up years before. This true crime story proved to me that while society may be accepting of men who desert their wives,their families even covering up for them by saying the woman was a terrible wife,petty crimes like gambling and small scam jobs,living by the seat of your pants with petty crimes and legal forms of desertion and treating people terribly whilst still not breaking the law will in the end result in a crime which is found to be illegal accompanied by a jail sentence.What I am trying to say is beware the member of your family who indulges in these petty crimes that the family laughs about on a Sunday.Small crimes which they consistently get away with creates a mind that believes it needs to move the goal post a little further until eventually it is too late.Regardless that the offender's life will be over in the "free" sense this final ultimate crime normally has a victim who loses their entire life. I actually know someone just like this and this book has made me realise that perhaps all is not well.This man had his first child with one woman he never married.He also refused to claim the child as his own and has never met this daughter.She will be 18 on the 6th December this year.Then he had another daughter,also did not marry the mother(relationship ended when daughter was 2).This daughter,he has had a relationship with but did stop paying maintenance 4 1/2 years ago.This daughter is 15.Then he went on to marry a girl and had a daughter with her.He started an affair and they got divorced when this daughter was 2.Also did not pay maintenance until about 6 months ago when this mother took him to court and the arrangement is that he pays 25% of what he should actually pay.He has now married the woman he had the affair with,and now has another daughter who is about 10 months old.He has for the past 5 or so years insisted on being self employed.He has not really brought in any money to even talk of and this new wife seems to be supporting him.He insists on living the life of the upper middle class and she supplies the money to help with this facade. This book was good reading,although when we got to the court case I started dreading a rehash of all the details supplied earlier.Mercifully the court case was quite short and the book ended with Bill Rundle getting sentenced (after a plea bargain). This book sounds fascinating. I hadn't heard of this crime before. I'll have to read this one! Thanks for stopping by my blog...I love true crime stories. "I actually know someone just like this and this book has made me realise that perhaps all is not well." Oh gosh, you gave me chills! I haven't read this book, but I just wanted to write and tell you how much I enjoy this blog! I'm subscribed through email, and the daily posts are wonderful. Great job! Yvette Kelly ~ Well, you definitely woke me up...lol! It is scary to actually know someone who is like one of the people in a true crime. Enjoyed this post! Keep up the good work! It actually got worse just last nite.The new wife (I think by mistake dialled my number-happens often my name starting with Y)at 1h30 in the morning and I got to listen into a big argument.I called the police and they went over to see.I have no idea what's happened since then..